The Cisco UCS Performance Manager provides visibility from a single console into UCS components for performance monitoring and capacity planning. It provides data center assurance of integrated infrastructures and ties application performance to both, physical and virtual infrastructure performance. This allows network staff to optimize resources and deliver the best services for their clients. Cisco UCS servers are designed for data center operations management solution. It also unifies the monitoring of key applications, business services, and integrated infrastructures. Stretching across dynamic, heterogeneous, physical, and virtual Cisco UCS-powered data centers. The Cisco Unified Computing System uses Cisco UCS B-Series Blade Servers, along with networking and storage access simplified management, cost efficiency, increased visibility and control in the data center networks. The UCS B200 M4 Blade Server delivers performance, flexibility, and optimization for data centers around the world and it can be deployed remotely for companies who require it. 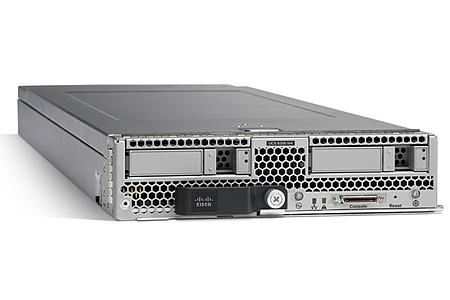 This Cisco B200 server offers market-leading performance, versatility, and density. Capable of a wide range of workloads ranging from web infrastructure to distributed databases in the networks. The Cisco UCS B200 M4 server can quickly deploy stateless physical and virtual workloads, with the programmable ease and simplicity of the Cisco UCS Manager Software. 24 DIMM slots for industry standard DDR4 memory. With speeds up to 2400 MHz while offering up to 1.5 TB of total memory when using 64 GB DIMMs. In B200 M4 has two optional, hot-plug SAS and SATA hard disk drives (HDD’s) or solid-state drives (SSD’s). Cisco UCS Virtual Interface Card (VIC) 1340, is a 2-port - 40 GB Ethernet Fiber Channel (FCoE). Delivers 80 Gbps to the server. Adapts to either 10 or 40 Gbps fabric connections. Cisco Flex Storage local drive subsystem provides flexible boot and local storage capabilities. Allowing you optional support for NVIDIA M6 GPU. Configure the Cisco UCS b200 M4 to meet your local storage requirements without having to buy unnecessary power and cool components. Choose an enterprise-class RAID controller, or go without any controller and drive bays if you're not utilizing local drives. Easily add, change, or remove Cisco FlexStorage modules. The Cisco UCS b200 M4 server is a half-width blade. Up to eight can reside in the 6-rack unit. The Cisco UCS B200 M5 is used for remote sites and data centers. The enterprise-class Cisco UCS® B200 M5 Blade Server delivers market-leading performance, versatility, and density without compromise. Ranging from web infrastructure to distributed databases and networks. The Cisco UCS B200 M5 server is a half-width blade. Up to eight servers can reside in the 6-Rack-Unit. The Cisco UCS 510 8 Blade Server Chassis, offers one of the highest densities per rack unit of blade chassis in the industry. You can depend on the Cisco UCS B200 M5 to meet your local storage requirements without having to buy power and cool components that are unnecessary. The Cisco UCS B200 M5 is designed for achieving high-class performances in your data centers. 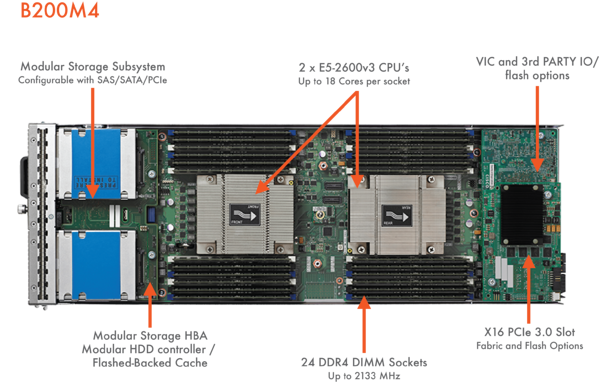 The Cisco UCS b200 M5 can provide up to two Intel Xeon Scalable CPU’s with up to 28 cores per CPU. 24 DIMM slots for industry-standard DDR4 memory at speeds up to 2666 MHz. With up to 3 TB of total memory when using the 128-GB DIMMs. Modular LAN on motherboard (mLOM) card, Cisco UCS Virtual Interface Card (VIC) 1340, 2-port and 40-GB Ethernet, Fibre Channel over Ethernet (FCoE)-capable mLOM mezzanine adapter. Optional rear mezzanine VIC with two 40 GB ports. Or two sets of 4 x 10 GB unified I/O ports, delivering 80 Gbps to the server. Adapting to either 10 or 40 Gbps fabric connections. Two optional, hot-pluggable, HDD’s, SSD’s, or nonvolatile Memory Express 2.5-inch drives. With a choice of an enterprise-class RAID or pass through controllers. Support for SD cards or M.2 SATA drives for flexible boot and local storage capabilities. Support for 2 optional GPU’s. Support for one rear storage mezzanine card. Support for one 16-GB internal flash USB drive. Ready to see some pricing?